A short stroll from Jones the Grocer led us to House. I was actually quite surprised when I read on House’s website that it’s under the Spa Espirit Group(which also manages STRIP, Browhaus, MASK, Qi Mantra, Skinny Pizza & Tippling Club) since I normally associate Espirit with the Hong Kong apparel brand. Consisting of a Beauty Emporium, Barracks Cafe and Camp Bar, House embodies the trinity of therapies that every girl (and me) dreams of; a lifestyle of decadance and hedonism. Imagine kicking off a lazy Saturday afternoon(or better yet a weekday) with a relaxing massage, spa and facial, followed by an awesome dinner and chilling out with a fresh cocktail thereafter. It’d be difficult not to feel at home in the lap of such luxury. A teeny bit of history lesson for those who don’t already know, Dempsey used to house the former British army barracks as well as the Central Manpower Base of Singapore(CMPB), thus giving rise to eatery names such as CMPB, Barracks and Camp Bar. SW had mentioned to me that the truffle fries & skinny pizzas here are to die for and that was my main goal today! 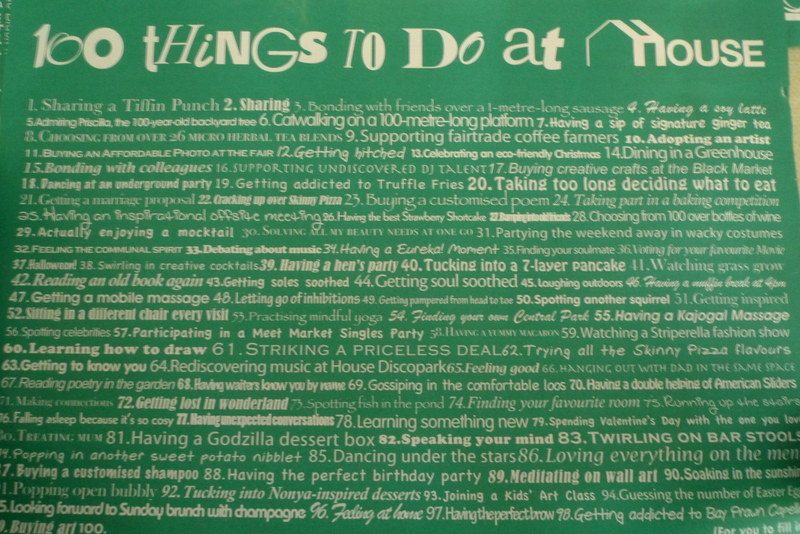 Unsure of what to do or just plain bored, here are 100 things to do at House while waiting for your nosh to be served. 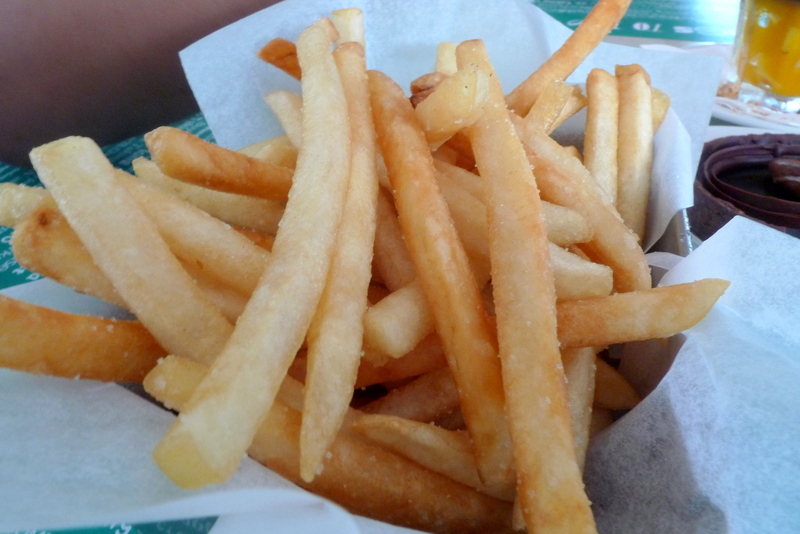 It looked like the fries next door but the fragrant aroma gave it away, the purportedly legendary Truffle Fries($9++). Is this how truffle oil smells like? A wiff similar to fried garlic but not as pungent and much more desirable. Definitely a joy to pop even without any condiments, it does live up to it’s reputation. A common misconception about Truffle Oil is that it’s made from truffles. It’s not! Most truffle oils are actually just olive oil combined with a synthetic odorant found in truffles, and from what I remember there’s only 1 brand that produces AUTHENTIC truffle oil. 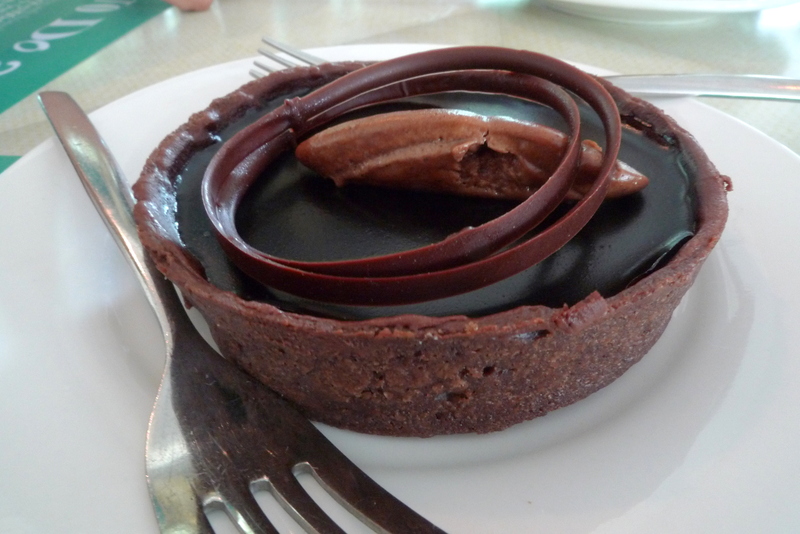 I’m sad to say nothing comes close to dethroning Laurent Bernard’s Dark Chocolate Tart, not even the one at Barracks Cafe. The chocolate was just not as rich nor fresh. 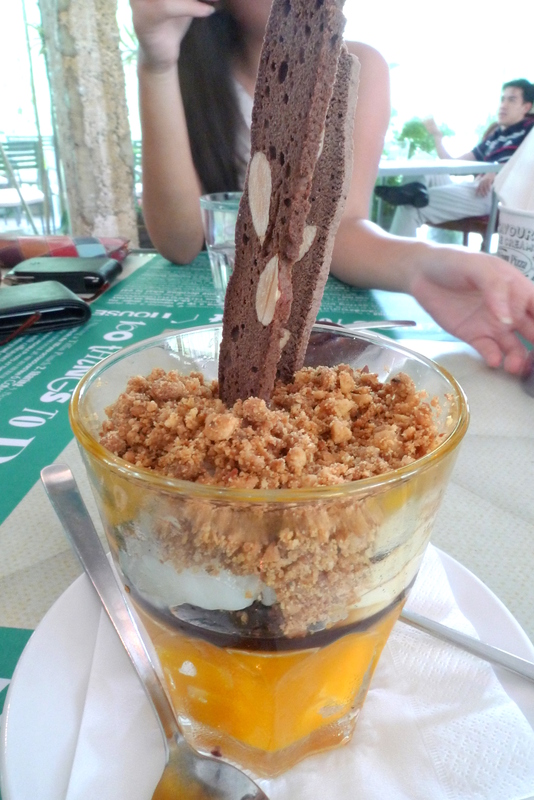 The Mango Crumble was a most welcome change of pace from the heaty fries and chocolate. Chopped nuts, crumble and sweet mellow cubes of mango makes for a pleasant dessert to cool off in Singapore’s perpetual summer heat. That said, I can’t wait to grow up(and not rely on father-mother scholarship), where I can guiltlessly savour life in it’s fullest, rationalizing that a hard week’s work(with uncorrespondingly pathetic paycheck) justifies a whole Saturday at the spa, at the cafe and at the bar @ House. Categories : All YumYums in my TumTum, Brunch, Cuisine Type YumYums, Dempsey / Holland V, Desserts, Location of YumYum, Western, Yummy!